We love our dogs and naturally want the best for them. As dog owners, it is important that we meet our dog’s needs and when we put our dogs into the care of others, we need to be sure that those needs are continued to be met. It is vital for any professional Dog Walker/Pet Carer to have a knowledge of the Hierarchy of Dog Needs (illustrated below) and that they meet every single one of them when caring for our dogs. 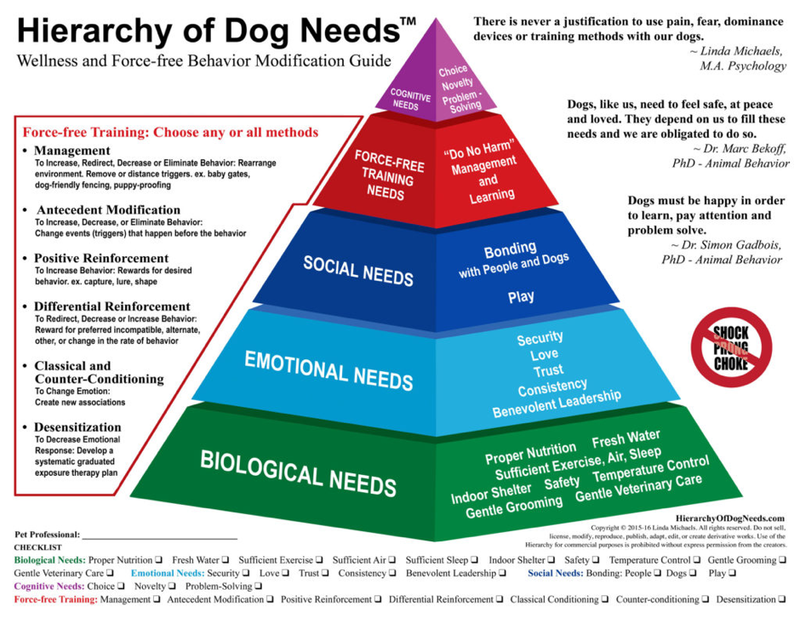 The Hierarchy of Dog Needs ™ (HDN) is a wellness and force free behaviour modification guide, developed by Linda Michaels M.A Psychology. Over recent years, the dog care industry has boomed with more and more people setting up their own dog walking and/or doggy daycare business. With so much choice though, how do you decide which of these businesses you can really trust to appropriately care for your furry companion? Well, surprisingly, it’s not that hard. It just takes a little research, time out to visit several centres, observation and asking questions. If the daycare centre you are thinking of using does not allow clients or potential clients to visit the premises – stay clear, they are likely to be hiding something! You wouldn’t leave your child at a nursey or school you weren’t allowed to visit and this should be the same for your dog! Here are some factors you should consider when looking for a dog care provider to ensure that you choose a business that is safe, reliable, trustworthy, suitably insured and provides for all their needs in a kind and positive environment and atmosphere. 1. Where do I start looking? A Google search is often the first point of call for most things these days, but remember that not all businesses have a website. Whilst there may be some great dog care providers to be found on Google, there are also some poor ones. It is a good idea to seek local recommendations from those in the know including trainers, other dog owners and vets etc. Ask to see testimonials (that are current, recent and up-to-date) and seek references where possible. Don’t just take one person’s word for a dog carer, seek a number of recommendations in order to make the best and most informed choice. Don’t just rely on the references that the dog carer provides you with – they will be selective in the ones they let you see! 2. Should I choose a one person band or a bigger set-up? I wish I had a straight forward answer for you to this question, but I cannot say that one is more reliable than the other or that one is better than the other. For me, it is down to the care that each business provides and the way in which they go about providing that care. It is also extremely important to consider the needs of each individual dog – is your dog comfortable around large groups of dogs for example? If they aren’t, then they will not be suited to a company who looks after a large number of dogs (see point 10). Really, it should come down to picking the business that feels best for you and your dog. Remember, there is little to no oversight in dog walking – ‘bosses’ rarely see their ‘employees’ at work and dogs aren’t great in delivering reliable feedback. So ultimately, the person who is walking your dog, whether they are self-employed or working for a company, is alone with your dog almost all of the time. You must take time to get to know them yourself. If you do opt for a larger dog care service, I would encourage you to insist on personally meeting each person that may be assigned to look after your dog and to go through a meet and greet/trial walk with each person. This is an absolute must! Untrained staff will inevitably miss vital signs that a dog is not happy and this can lead to disastrous consequences. Qualified staff can spot bullies, scared dogs or dogs that have shut down and in each instance, they will know how to deal with these situations appropriately. They will be able to ensure that all dogs have positive play experiences and know how to engage them in safe play with both dogs and humans. It is vital to ask what training a person has had on canine body language, managing dogs effectively, introducing dogs positively and how to break up dog fights (yes, unfortunately it can happen). Bullies do exist in the dog world. Pushy dogs constantly pester and pick on other dogs by pinning down, backing a dog into a corner, chasing and rolling and body slamming. Bullies should not be allowed to practice this behaviour during playtime – if they do, they will only get worse and this is not fair to the other dogs. Bullies should be removed immediately and if the behaviour continues, should not be allowed back. Ask your day care centre what policy they have on managing dog play times, especially around bullies. Ideally you are looking for someone who has at least 6 months to a year’s experience before they are able to manage dogs playing. Don’t be afraid to ask for proof of qualifications and their commitment to continued professional development. It goes without saying that any dog care provider should have an up-to-date and current canine First Aid certificate. 4. Do you like them? Do you trust them? And does your dog! You MUST like the person that will be taking care of your dog but more importantly – your dog must like and trust them too! It isn’t just about getting on or tolerating each other either, there must be a strong relationship between the carer and your dog and one that is built on trust and understanding. The person taking care of your dog MUST take the time to understand their little quirks, what they love, what they are motivated by, what they are nervous of, what commands they respond to, any issues they have (are they resource guarders around other dogs for example), what health conditions do they have, are they allowed to swim, what are their energy levels like, where should they be left when taken home etc. The dog carer should NEVER treat every dog the same – they should always be considering and catering for each dog’s individual character and personality. A good doggy day care provider would allow you to come and see their facilities, show you around and let you see the dogs interacting with each other. A good dog walker would allow you to accompany them on a walk. This should be done without your dog to enable you to remain focussed and give you opportunities to ask questions (your own dog should not be introduced without a full consultation first). You should feel relaxed during any visit and you should be allowed appropriate time to ask questions without you feeling rushed. If you are not happy with what you see or hear or your instinct is trying to tell you something is wrong – walk away. If you are happy with what you see, arrange for the dog carer to come and meet your dog at your home and carry out a full, detailed consultation on your dog – this time, where they ask most of the questions to enable them to gain as much information on your dog as possible. They should be asking things about your dog’s temperament, diet, exercise regime, energy levels, health requirements, behavioural issues, socialisation, training and they should also run through their terms and conditions in detail with you. Introducing a new dog into an existing pack is an important step and nothing should be left to chance in ensuring that all parties are going to be happy. 5. Are they sufficiently insured and licensed? Shockingly, anybody can call themselves a professional dog walker, or day care provider, even someone who has very little experience with dogs. Despite the growing industry, there is still no dedicated regulator for dog walkers or day/night care providers. However, in Reigate and Banstead (each area will have different licensing requirements), any home boarding service for dogs where a fee is charged for the service will need to hold a licence from the local authority. You should therefore, ask to see the licences and affiliations to ensure that the person/business you are considering is going some way to being professional and responsible. 6. How many dogs should they look after at any one time? Again, this is an unregulated business and so there is no specific answer to this. In terms of day care, according to many canine behaviour experts the dog to human ratio should be no more than 15:1 in a day care facility, however, it is recognised that smaller ratios are even better! Personally, my advice as a trainer (and what I would personally look for as a dog owner seeking day care) is one staff member for eight dogs – I think that is plenty. A dog carer should be present to ensure that all dogs are having fun, playing politely and removing dogs that are tired or no longer wanting to play. If there are too many dogs per person, this won’t happen and it will become a free-for-all meaning that your dog may learn to threaten other dogs in order to keep them away. In terms of group size, there should never be more than 10-15 dogs to any individual group. Additionally, each dog should have 75-100 sqft of play space within a group. That means that for a 15 dog play group, the facility should have no less than 1500sq ft just for that one group of dogs. Always ask how many dogs they have in day care each day and what the dog to human ratio is. Don’t forget to ask whether the number of dogs in day care includes their own dogs (some people who own day care centres have a surprisingly large amount of dogs of their own and they neglect to include these in the figures they provide you with). In terms of Dog Walking numbers a Dog Walker should never take out more dogs than they can safely handle and observe. They must be aware of the dogs they are matching and of any other dogs they may come across in the walking area. Some local authorities have capped the amount of dogs you are allowed to walk. In Reigate and Banstead it is an offence for a person to have more than 6 dogs under their control at any one time. I personally walk no more than 4 at a time as I feel this allows for more individual bonding/play time with me and enables me to cater for all individual quirks, personalities and needs whilst we are out and about. On my walks, I not only cater for their exercise requirements, but their mental stimulation needs as well. Toilet accidents and mess should be cleaned immediately and not left until the dogs have gone home or until the next day. The area should be cleaned with disinfectant and be free from any odour. Dogs accepted into the company should be vaccinated as disease spreads quickly when large groups of dogs are housed together. Also play areas should be disinfected every day, once all dogs have gone home. Find out what their cleaning regime is. 8. What is their philosophy of dog rearing and care? Dog care facilities should only employ positive reinforcement and force free tactics. Anything else is scientifically proven to be harmful to your dog both physically and emotionally. Avoid anyone who uses ‘pack leader’ or ‘dominance’ techniques. It is so important to not just to ask if the business provides a positive reinforcement facility but to ask exactly what that means to them and how they go about discipline? Discipline from many dog care providers is shocking and you are looking for a facility that NEVER uses harsh corrections, alpha rolls, water squirters or other shock tactics to discipline dogs. 9. What will my dog get up too? Your dog day care provider should be able to give you an exact schedule for your dog’s time in their care. There should be organised play, education, cleaning, feeding, sleep etc. Their time there should not be a free-for-all and just include a run around in a field all day. Their daily programme shouldn’t just be spending the day being physically exercised so you need to find out what programmes are in place to keep them mentally and emotionally stimulated. Also find out what shelter is provided to them normally, and in the heat/cold/rain. As a Professional Dog Walker myself, I take great pride in the service I provide. I walk the dogs in different places, take different routes and ensure I am mentally stimulating their minds and senses. On a walk, my priority is the dogs in my care, not the person I might meet to stop and have a natter to while the dogs get bored of sniffing the same area for 40 minutes! I do not use my phone (unless I’m taking photo’s of the dogs!). I cover a great distance on my walks (you’ve only got to ask to see my FitBit!) and because of that, I know the dogs will be content and tired when I return them home. Being a Dog Walker is a skilled profession and there are many good ones out there, but it is important to ask about what your dog is going to be doing on a walk or during their time in day care. 10. Will my Dog Like Day Care or Group Walks? Many dogs do not enjoy playing with other dogs and this is OK! Just because your dog does not enjoy day care does not mean there is something wrong with them or that they have issues. It is perfectly acceptable for a dog to prefer the company of one or two close friends as it is for a dog to love the doggy day care lifestyle. Some humans are social and enjoy the company of others, some don’t like being in large rowdy groups (me included)! So why should we force this on our dogs if they aren’t that way inclined? Your dog is fearful around other dogs (runs away, hides, tucks in tail, holds ears back etc). Putting this kind of dog in day care or on group walks will only exacerbate their fear and they may end up escaping, bolting or running away if they become loose – they certainly will not enjoy the experience of day care. If dogs are allowed to approach a scared dog, they may well learn to fight back to try and defend themselves – is this a behaviour you want your frightened dog to learn? No! Your dog acts aggressively around other dogs. Dog caring facilities can be a valuable option for many dog owners, but please remember that not all dogs suit a day care/group walk environment. These dogs may prefer to have their needs met by a private dog walker rather than a boisterous doggy day care environment. 11. How are the dogs transported? Ask to see the vehicle the dogs will be transported in and find out how many are put in the vehicle at any one time. Are they restrained safely? How many are put in each crate? What happens in extreme weather - is there air conditioning or extractor fans? What would happen during a breakdown or accident? All vital questions to ask and it is very important to see the dogs in transit – not just when the van is empty. 12. What Questions to Ask! 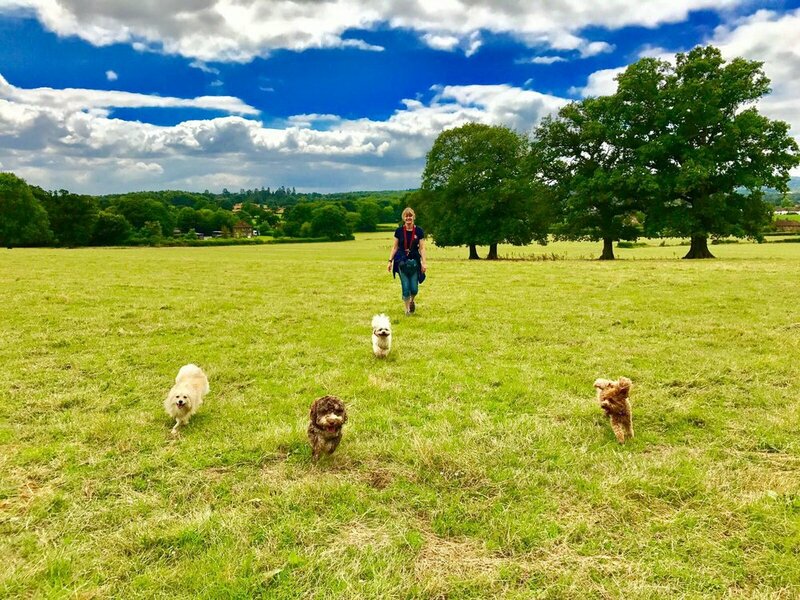 There is a lot of information included within this blog and I apologise it is a long one, but choosing the right dog carer is SO vitally important. I have already mentioned within the blog some questions to ask, but to help you further, please take a look at this link from Dog Training Nation which includes a great list of questions to ask any prospective dog care provider. Finally, remember to seek recommendations, consider a number of options before choosing, ask lots of questions, visit the facilities and if you have any doubts – listen to them – your instincts are probably right!